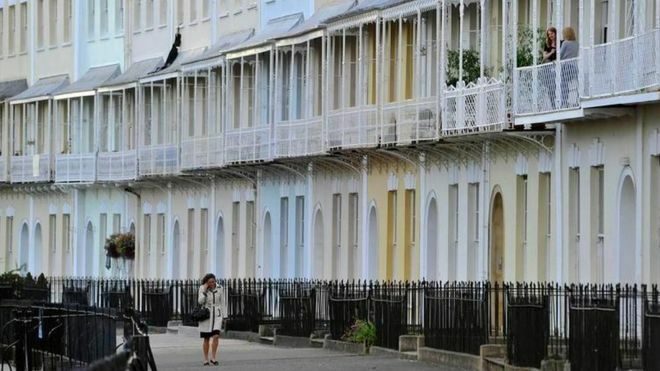 Annual growth in UK house prices accelerated for the first time in eight months in November, a lender’s figures show. The Halifax, part of Lloyds Banking Group, said property prices had risen by 6% compared with a year ago. That meant the cost of a typical home was £218,002, it said. The faster price growth is in contrast with figures from rival Nationwide, which said annual house price growth had slowed to 4.4%. Annual property price growth peaked at 10% in March. The Halifax said that, despite the pick-up it reported in November, “annual house price growth may slow over the coming months”. Prices were up by 0.2% compared with October, and had risen by 0.8% in the three months to the end of November compared with the previous quarter, it said. Industry figures welcomed the pick-up in prices. Russell Quirk, chief executive of eMoov, said: “Many in the industry have been quick to put the boot in over the last few months where the UK property market is concerned, hanging gloomy predictions on a dwindling level of demand in the market. The Halifax said that low mortgage rates were maintaining demand among potential buyers. But HSBC has just pulled one of the cheapest deals – a 0.99% two-year fixed-rate deal off the market. Mortgage broker Aaron Strutt, of Trinity Financial, said the lender was inundated with enquiries, which could have led to it being withdrawn, despite the relatively high arrangement fees connected to the deal.